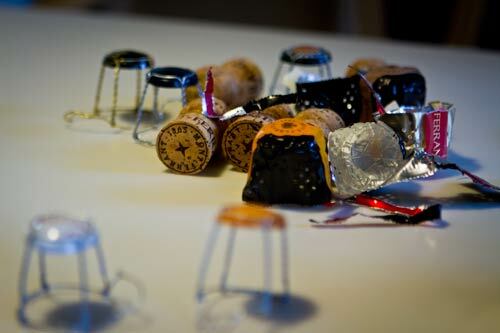 You open up a lot of Cava, you get a lot of corks as shown by the photo above. Yesterday we visited the cellars of Mont Ferrant, who are apparently the oldest Cava maker in all of Spain. For those unfamiliar, Cava is just the Catalan name for their Champagne as naturally they can’t use the very protected French one. Same process, different grapes, but in the end you get a bubbly flute glass to toast with. They are a massive enterprise with a building that drops four stories down in to the sandy earth of the seaside town of Blanes, the “gateway to the Costa Brava”. Amongst the rather ugly 60’s and 70’s buildings, a 19th century winery might seem to be an odd thing to have, but in the past, prior to the “second plague” of beach tourism, the entire area was covered in wine vines for making Cava. These days, with the wine vines having been replaced with concrete homes for lobstery Northern Europeans, Mont Ferran sources all their grape from Penedès in the official DO Cava. They bottle and age at this old building though and are able to maintain a level of quality to their bottles that’s quite impressive for a company that fills half a million of them each year. We are quite happy to be featuring them in our Empordà wine guide despite their being just outside the county as they are quite noteworthy.